This section discusses some basic concepts of GPR modelling. gprMax solves Maxwell’s equations using the Finite-Difference Time-Domain (FDTD) method. Detailed information about the use of FDTD for GPR modelling can be found in [GIA1997] and general information on the FDTD method in [KUN1993] and [TAF2005]. The nature of the GPR forward problem classifies it as an initial value – open boundary problem. This means that in order to obtain a solution you have to define an initial condition (i.e. 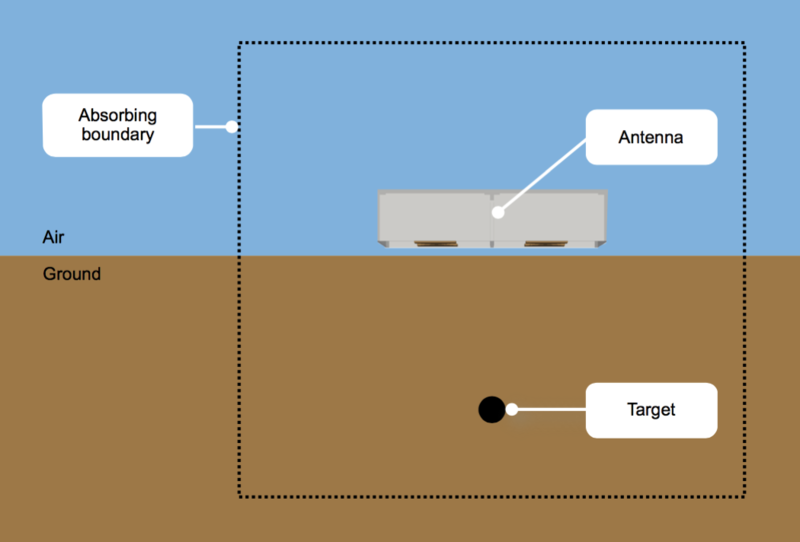 excitation of the GPR transmitting antenna) and allow for the resulting fields to propagate through space reaching a zero value at infinity since, there is no specific boundary which limits the problem’s geometry and where the electromagnetic fields can take a predetermined value. Although the first part is easy to accommodate (i.e. specification of the source), the second part can notbe easily tackled using a finite computational space. The FDTD approach to the numerical solution of Maxwell’s equations is to discretize both the space and time continua. 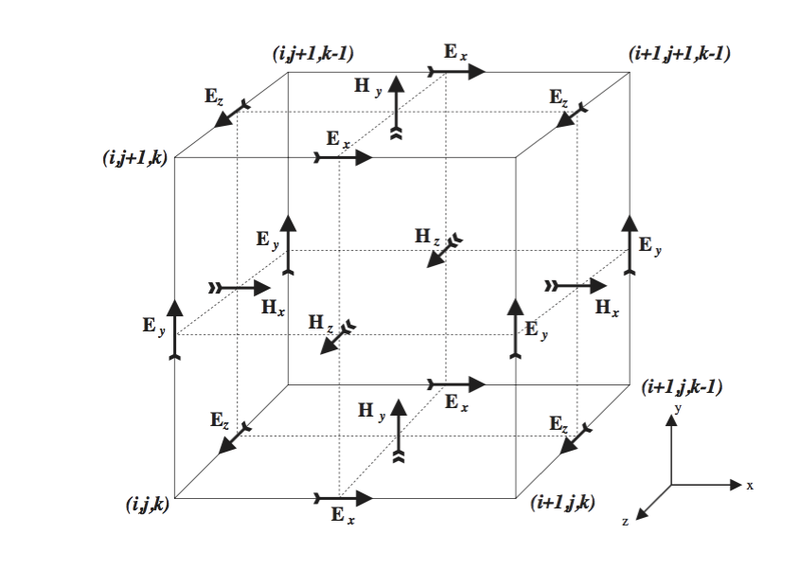 Thus the discretization spatial \(\Delta x\), \(\Delta y\) and \(\Delta z\) and temporal \(\Delta t\) steps play a very significant role – since the smaller they are the closer the FDTD model is to a real representation of the problem. However, the values of the discretization steps always have to be finite, since computers have a limited amount of storage and finite processing speed. Hence, the FDTD model represents a discretized version of the real problem and is of limited size. The building block of this discretized FDTD grid is the Yee cell [YEE1966] named after Kane Yee who pioneered the FDTD method. This is illustrated for the 3D case in Fig. 2. The numerical solution is obtained directly in the time domain by using a discretized version of Maxwell’s curl equations which are applied in each FDTD cell. Since these equations are discretized in both space and time the solution is obtained in an iterative fashion. In each iteration the electromagnetic fields advance (propagate) in the FDTD grid and each iteration corresponds to an elapsed simulated time of one \(\Delta t\). Hence by specifying the number of iterations you can instruct the FDTD solver to simulate the fields for a given time window. One of the most challenging issues in modelling open boundary problems, such as GPR, is the truncation of the computational domain at a finite distance from sources and targets where the values of the electromagnetic fields can not be calculated directly by the numerical method applied inside the model. Hence, an approximate condition known as absorbing boundary condition (ABC) is applied at a sufficient distance from the source to truncate and therefore limit the computational space. The role of this ABC is to absorb any waves impinging on it, hence simulating an unbounded space. The computational space (i.e the model) limited by the ABCs should contain all important features of the model such as sources and output points and targets. Fig. 3 illustrates this basic difference between the problem to be modelled and the actual FDTD modelled space. In order to make the most of gprMax in modelling GPR responses ultimately you should be familiar with the FDTD method on which these programs are based. There is a very large amount of information available in the relevant literature. Good starting points are [KUN1993] and [TAF2005] where as the specific application of FDTD to the GPR forward problem is described in [GIA1997]. A right-handed Cartesian coordinate system is used with the origin of space coordinates in the lower left corner at (0,0,0). Fig. 4 illustrates the coordinate system of gprMax. Only one row of cells in the x direction is depicted. The space coordinates range from the left edge of the first cell to the right edge of the last one. Assuming that \(\Delta x = 1\) metre, if you wanted to allocate a rectangle with its x dimension equal to 3 metres and its lower x coordinate at 1 then the x range would be [1..4]. The 3D cells allocated by gprMax would be [1..3]. In the 3D FDTD cell there are no field components located at the centre of the cell. 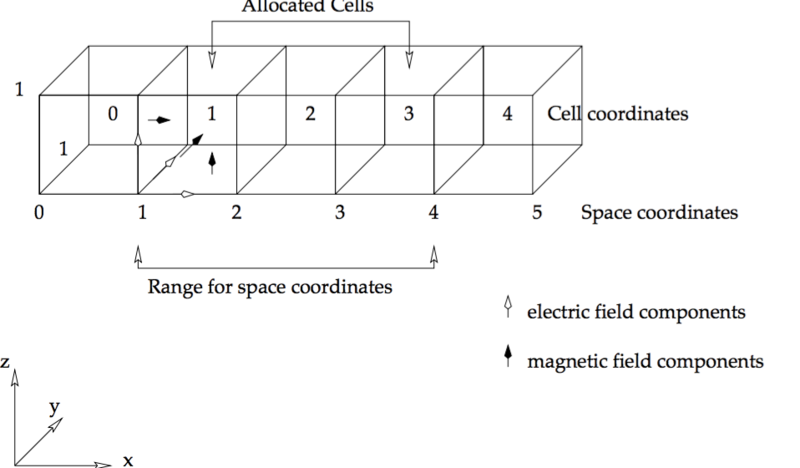 Electric field components are tangential to, and magnetic field components normal to the interfaces between cells. The field components depicted in Fig. 4 correspond to space coordinate 1. Source and output points defined in space coordinates are directly converted to cell coordinates and the corresponding field components. Fig. 4 gprMax coordinate system and conventions. The absorbing boundary conditions (ABCs) employed in gprMax will, in general, perform well (i.e. without introducing significant artificial reflections) if all sources and targets are kept at least 15 cells away from them. gprMax uses Perfectly Matched Layer (PML) ABCs based on a recursive integration approach to the complex frequency shifted (CFS) PML [GIA2012]. A general formulation of this RIPML, which can be used to develop any order of PML, has been used to implement first and second order CFS stretching functions. One of the attractions of the RIPML is that it is easily applied as a correction to the field quantities after the complete FDTD grid has been updated using the standard FDTD update equations. The cells of the RIPML, which have a user adjustable thickness, very efficiently absorb most waves that propagate in them. Although, source and output points can be specified inside these cells it is wrong to do so from the point of view of correct modelling. The fields inside these cells are not of interest to GPR modelling. Placing sources inside these cells could have effects that have not been studied and will certainly provide erroneous results from a GPR modeller’s point of view. The requirement to keep sources and targets at least 15 cells away for the PML has to be taken into account when deciding the size of the model domain. Additionally, free space (i.e. air) should be always included above a source for at least 15-20 cells in GPR models. Obviously, the more cells there are between observation points, sources, targets and the absorbing boundaries, the better the results will be. This user guide, can not serve as an in depth tutorial and a review of the FDTD method. However, some useful hints and tips are given here in order to cover the most fundamental aspects of using an FDTD based program and avoid the most common errors.